When the Soviet director Yuri Aldokhin traveled to Mali in its first flush of independence under President Modibo Keïta, Aldokhin was told, unusually, to make friends. In most cases, Soviet auteurs working outside the USSR were instructed to eschew contact with the locals, to travel everywhere in groups of three. But Mali under Keïta had chosen the socialist path of development, and the Kremlin would do everything in its power to keep Mali in the right camp—hence Aldokhin’s expansive brief. The Moscow-based Central Studio for Popular Science Films dispatched Aldokhin to Mali in 1960 to capture in film the country’s heroic socialist transformation. Aldokhin’s film was one of many that the Soviet state commissioned in Africa, said Alexander Markov during a talk on March 26 at the Jordan Center. Markov is a documentary filmmaker and Visiting Fulbright Scholar at New York University. He has directed films in Saint Petersburg and internationally, as well as taught documentary directing at the Saint Petersburg State Institute of Film and Television and worked as an independent curator. Soviet films about Africa straddled the line between their creators’ artistic ambitions and the requirements of Soviet foreign policy, which sought to support African countries on the socialist side of the Cold War divide, Markov said. Due to the rigors and occasional danger of filming in Africa, production studios often sent younger filmmakers, or less established crews based in Soviet republics like Lithuania and Georgia, Markov said. Some were veterans of World War II. Many, inspired by the wave of decolonization sweeping through Africa, as well as the Khrushchev-era thaw, took an experimental approach to their work. Yet, government bureaucrats controlled the final cut, or even whether to screen a completed film for the public. 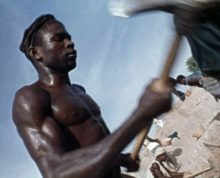 Jambo, Tanzania, a 1974 film by Lithuanian director and cinematographer Viktoras Starošas, shows the extent of state meddling in the filmmaking process. From the start, the project required approval from the KGB. “Without their carte blanche, no one would have even budged,” Starošas said in a taped interview with Markov. Upon the crew’s arrival in Tanzania, the embassy assigned them a “production assistant”—in fact, a military intelligence officer who would keep an eye on their activities away from home. Starošas’s team filmed Tanzanian collective farms, where they staged bustling productivity for the camera. After the film was edited, the Ministry of Foreign Affairs instructed Starošas to recut it to remove any white people or women wearing pants, including the renowned British paleoanthropologist Mary Leakey. “The film’s entire structure was ruined and collapsed,” Starošas told Markov. Markov divided Soviet productions in Africa into the three periods. The first, running until around 1969, adopted a strident, triumphant tone and depicted newly formed African countries casting off the colonial yoke in favor of socialist development—with Soviet assistance, of course. In the 1970s, the Soviet presence in Africa became more normalized, and films focused more on practical projects that Soviet engineers undertook in Africa such as the construction of schools and hospitals. Finally, in the 1980s through the Soviet collapse in 1991, directors turned their cameras to civil wars in Angola and Mozambique and adopted a more classic documentary style. Soviet productions were sometimes caught in historical events, yielding altogether different films than what the studio had planned. The Congo in Strife began as an educational travelogue, but the crew found themselves in the Democratic Republic of the Congo on the eve of Patrice Lumumba’s ouster and execution. After traveling with Lumumba into the Congolese jungle and filming his speeches, the Soviet production ended abruptly when Lumumba was deposed. With a pro-Western regime in power, the Soviet embassy—and film crew—was forced to leave the country. Political controls operated at many stages of a Soviet production, Markov said. Within studios, directors answered to supervisors with total creative control over finished productions. Or a director might use footage in a way unrecognizable to the videographer who shot it. Markov recalled meeting a videographer who had worked in Angola in the 1980s. As Markov sat with the videographer in a film archive, watching scenes he had filmed decades earlier, the videographer objected “it wasn’t me”—he could no longer recognize his work in the final product. Still, Soviet filmmakers believed in their work and the capacity of the camera to capture truth, Markov said. They had to. “Without belief, you can’t shoot,” he said.